> Mini Information & DIY videos & Tutorials > What Scale is My Doll House? What Scale is My Doll House? What Size Dollhouse Miniatures Should I Be Collecting? Dollhouses come in a wide range of standard sizes. How can you tell which size you should accumulate or build? How can you check the size of furniture you require for an antique house or toy dollhouse? Standardized sizes for modern dollhouses include 1:6, 1:12, 1:16, 1:24 and 1:48, while antique houses are often a custom size. Some scales are popular for collectors of artisan miniatures while others are more subsidiary for children's play or families who share a range of hobbies with kindred scales. Afore you invest in a dolls house, you should understand the sundry scales available, and determine which scale is best for your accumulation and skills. 1:12 scale sometimes called one-inch scale gained a widespread acceptance amongst collectors of artisan miniatures when it was chosen as the scale for Queen Mary's Dolls House. At a time when imperial rulers were marked in 1/12ths of an inch, this was and continues to be a popular size, which allows for the creation of greatly detailed miniatures. In 1:12 scale, doorways will be 6 - 7 1/2 inches tall (15- 19 cm) or larger, and most adult dolls are depicted at between 5 in (12.7cm) and 6 in. (15.2 cm) in height. 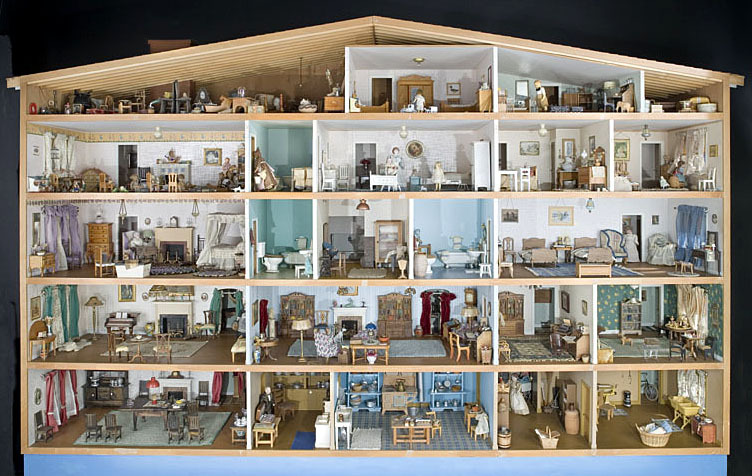 The scale is common in playhouses for younger children, with Plan Toys making their dolls, furniture, and some animals in roughly 1:12 scale and Calico Critters (Sylvanian Families) also making their toys and accessories in roughly this scale (except for the animals themselves). For collectors in all ranges, 1:12 scale is the most widely available dolls house scale. The scale is not popular for other miniatures, however, so cars or trains and some other accessories in 1:12 scale are difficult to find. Space considerations mean 1:12 scale is not as popular with collectors who want to make an entire scene with several buildings or outbuildings. There are some popular model horses (Breyer and others) in this scale, with a few animals. A wide range of animals are available from artisans, but common farmyard animals are limited in this scale. Items in 1:6 scale, additionally kenned as "Playscale" or "Fashion Doll" scale, are sized to fit with mundane fashion dolls such as Barbie, or collectible action figures, principally military action figures. In this scale, one inch is identically equivalent to 6 inches in full size. A standard 7 1/2 foot tall door would quantify fifteen inches (38 cm), while an adult male doll is 12 inches (30.5 cm) tall. Some artisan miniatures are engendered in this scale, mainly in modern styles. This is additionally the scale for most Japanese 'Re-Ment' adjuncts and plays foods. Lundby dolls houses made in Sweden, are made in the scale of 1:18, sometimes called 2/3 scale. They are often furnished with 1:16 scale furniture, as play furniture in these scales, is often 'fit the box' scale rather than strictly to size. 1:24 dollhouse scale or half scale is gaining ground in the U.K. and Europe as a popular miniature scale. This scale is more commonly found across scale hobbies, with "G" or garden scale railways producing many inexpensive figures and details in scales from 1:22 to 1:24. This is also a common play scale for children, as Playmobil houses and accessories are on this scale to go with the railroads and vehicles produced by Playmobil. There is also a range of inexpensive 'puzzle' houses available in this scale. 1:24 scale is also fairly popular for high-end die-cast car collectibles, so street scenes are much easier to construct in 1:24 vs 1:12 scale. In the dolls house artisan market, it remains somewhat of a niche, with some artisans in Europe producing duplicates of their 1:12 scale range in 1:24 scale as well. 1:24 scale items are becoming more widely available commercially, but the range is still limited compared to 1:12 scale. Some kit manufacturers, including The Daisy House, produce furniture kits in 1:24 scale. In 1:24 scale, a doorway is usually 3 to 4 inches (7.5to 10cm) high, with male dolls standing between 2 1/2 to 3 inches (6.5 to 7.5 cm) tall. 1:48 scale or quarter scale dolls houses are becoming increasingly popular, especially on the west coast of North American and in the U.K. This scale is similar to railroad "O" scale and building parts available for railroad buildings can be used for quarter scale houses. In this scale, a person 6 feet high in real life would be 1 1/2 inches (6/4) inches tall or almost 4 cm. This scale also works well for gamers who use 25/28 or 40 mm figures. Many of the gaming buildings available are either S or O railroad scale. 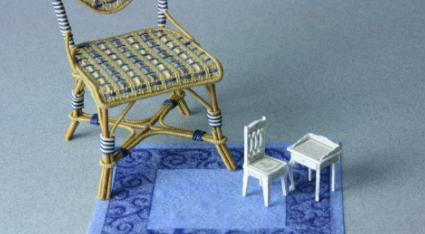 1:144 has been called Dollhouse for a Dolls House Scale or Micro Scale. Buildings this size can be used as 1:12 scale dolls houses inside a 1:12 scale dolls house. This is very close to the British "N" scale railway size of 1:148, and slightly off from the North American "N" scale railroad of 1:160 scale. It is a very popular size for Christmas Railway Scenes.